Since 1996, Goldrush Getaways has transformed the travel industry with its exclusive, award-winning, host-travel agency model. A full-service agency specializing in cruises, resorts, hotels, tours and vacation packages. Membership helps you become your own travel agent so you can earn commissions—and save thousands of dollars on your vacations! Save on cruises, tours, vacation packages and more! My wife and I joined Goldrush Getaways ten years ago and have never regretted a minute. The benefits have been overwhelmingly greater than any expenses incurred and far exceeded any expectations we had. Prior to our association with Goldrush Getaways, we travelled extensively throughout the world. This association has allowed us to continue our travels at a more economical rate and has allowed us to set up travel arrangements for others while making a profit at the same time. As with most ventures, you get out what you are willing to put into it. The staff have always been very professional, extremely helpful as well as friendly. We have taken all the training courses they have offered and found the training to be very useful when making travel arrangements for ourselves or for others. We would highly recommend Goldrush Getaways to anyone that has an interest in travel. I used Goldrush Getaways to take a river cruise on the Rhine in June 2010. They facilitated all of the travel arrangements including Air travel and a pre-cruise visit to Austria while going to see the Passion Play which is performed every 10 years. Everyone at Goldrush Getaways are polite, professional, and are very helpful in making sure the vacation is perfect in every way. I will have Goldrush Getaways arrange all of my travel experiences. My wife and I have been members since 2004. Through out our experience, Goldrush Getaways has guided, and educated us throughout our Travel business venture. Our commissions have been paid, even when we made a mistake. When ever we have called for assistance in either the Ontario office, or the Citrus Heights office, everyone has always went out of their way to assist us. You get out of the membership, what you put into it, and we are well on our way creating a nice retirement business as full time agents, and a nice client base too. As you progress as an agent you learn how and when to travel, which in turn saves you money. Thanks to all the staff who has helped, and continues to help us. We have been affiliated with Goldrush Getaways for several years now and have nothing but excellent experience. They are always there when we need them, they are reliable and we can depend upon them for useful and honest information. I would recommend them highly to anyone. Also, we get calls returned promptly which is unusual in today's world. My Wife and I have been members of Goldrush Getaways for a little more than seven years we have taken many trips to various places, we have been able to book some very exciting cruises during our time with Goldrush which in my opinion is where you can make the most money. When looking into a business venture one must put into it a lot of hard work to get the most out of it we continue to enjoy our vacations each year and help others with there travel needs. Our family has enjoyed multiple fine times on the high seas because of this organization and we look forward to many more. All presentations we've attended have been very informative and have enriched our cruising and ground travel experiences. The friendly staff have been very responsive to our needs, both in planning our "getaways" and while "on the road". One happy event, the recovery of a very expensive pair of sunglasses left at the Ritz-Carlton in Jamaica, would not have happened without the selfless, personal intervention of a Goldrush Getaway's Administrative staffer. We just love these guys! My husband and I joined in 2003. We are very happy to travel and help our friends join us whenever we go cruising. One time we booked 52 people which we had never done before and the staff at Goldrush Getaways helped us with the planning of the group. We both learned so much and we are so glad we joined. On our first cruise we saved so much and we continue to travel. Hi, I just wanted to drop a line and tell you what an outstanding job Tracy and her peeps did putting on the event yesterday; very professional and well done. All the vendors were very helpful and it was great to know they are there to help us with their products. My wife and I have been members of Goldrush Getaways for several years and find it very valuable. We act as travel agents for our family and friends. My wife and I have been members of Goldrush Getaways for several years and find it very valuable. We act as travel agents for our family and friends. I will also book travel for anyone, which Goldrush lets me do. It is a low cost way to be a travel agent. There are many other companies wanting to sign up independent travel agents, but most have a high monthly fee. If you want to set up an independent agency, you can and Goldrush is a good place to start and learning. We travel about three months out of the year and Goldrush Getaways gives us the ability to do this and save by knowing the best deals and learning about different vendors. If you don't want to travel it is not a good deal. Our first year with Goldrush Getaways has been all that we had hoped it would be. 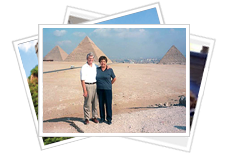 We've had some great trips and are looking forward to more adventures at good prices. Thanks for all your assistance this year.